The princess bride: Stunning pearl taffeta in a classic ball gown silhouette. A finely pleated taffeta skirt flares from your natural waist and is lined with L’Amore satin and a tulle petticoat for volume. The slim corseted bodice creates a small waist while the huge pleated skirt skims over your stomach and hips. This dress is big and bold, with a deceptively simple fit, from its defined bust cups and spaghetti straps, secured with fabric-wrapped buttons and a zip at the back, right down to the sweeping train. This dress can also be created from ivory satin (currently pearl coloured tafetta). 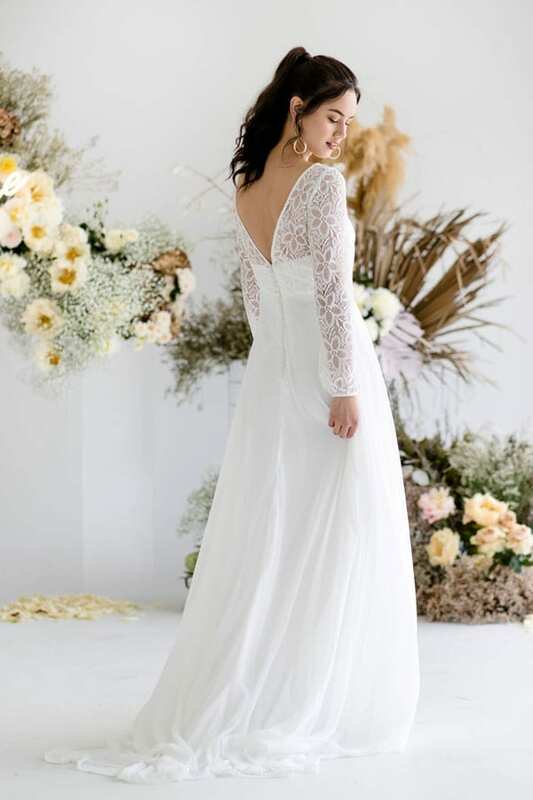 Go all out and wear open or closed toe stilettoes, with matching pearl drop earrings and a full length lace brimmed veil or plain single tiered. Katie recommends to wear this gown as per design. The pearl color taffeta mimics the colour of pure silk taffeta, it is royal and classy without the price tags.